Genuine Blackhawk! brand SERPA Belt Holster for Glock pistols in Black. Will accept Will accept Glock 17, 22, 31. Out of the box these look like something from Star Wars but use one and you won't go back to anything else. Developed from operational feedback these are possibly the cutting edge of holster technology. Utilising SERPA Technology these may be the fastest draw holsters we'll ever see. No thumb breaks or straps just an instinctive trigger finger press release. Despite the lack of straps these are still utterly secure. 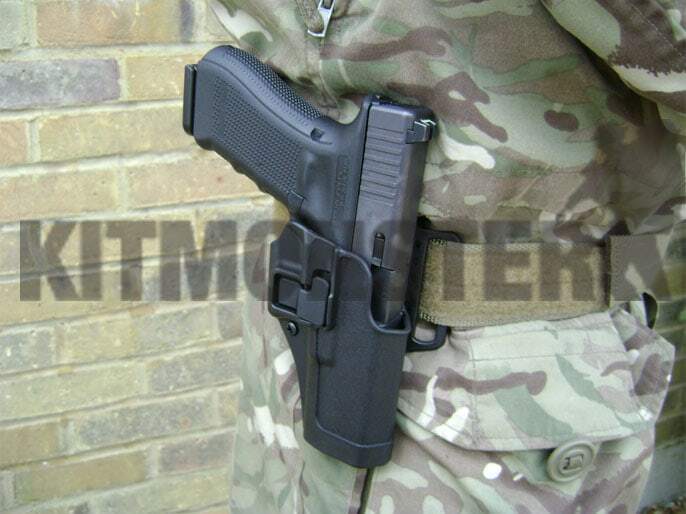 Moulded, rigid carbon fibre holster with SERPA Technology retention system. Supplied complete with 2 mounting options. Standard 'on the belt' with loops fitting belts up to 4cm wide, plus a paddle mount fitting belt up to 5cm wide. 3 Philips head screws allow quick and easy changes between these options. 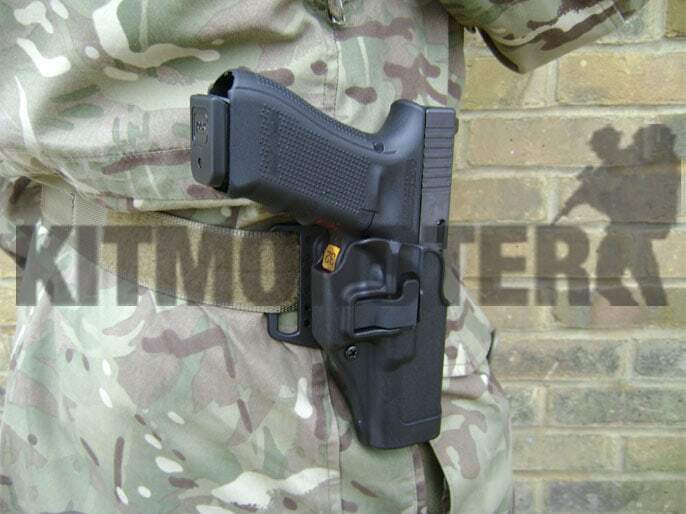 SERPA Holsters are issued to UKSF and recommended to us by a member of SFSG, and the ACQB Instructors at SRW/COTATT. SERPA Holsters can be seen in widespread use by UKSF in recent photographs from Baghdad. Quite simply the very best available today. Why trust your life to anything else? 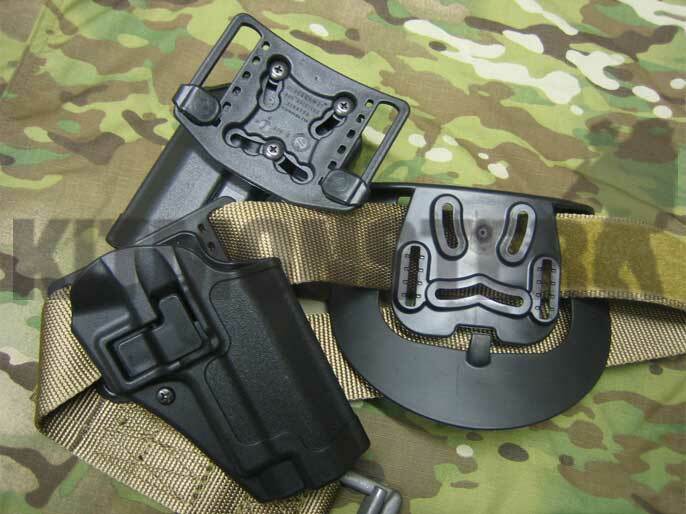 We also have SERPA Holsters with Drop Leg Platforms or MOLLE vest fittings. MOLLE Mounting Platform also available, again please see seperate listings. Fully compatible with all other items from the SERPA Holster range, no need to buy another holster, just the add on options. Rigger Belt for illustration only, not included. Please note Left Handed models are purchased to order, and may not be available for immediate dispatch. Grab Bag, Battle Bag, Coyote Tan, Blackhawk! Belt, 'Rigger' Coyote Tan, CQB/Rescue, 02 Medium by Blackhawk! Notify me of updates to Holster, SERPA CQC, Black, Glock 17, Belt, by Blackhawk!